Sustainable mobility is one of the 7 challenges OnePlanet @ VITO is taking on. Making its own vehicle fleet more sustainable is an absolute must, besides promoting public transport, carpooling and bicycle leasing. VITO will first replace all diesel cars with electric and plug-in hybrid cars, which will also serve as a “living lab” for research in the field of smart charging. VITO also focuses on sustainable sources of electricity for charging, with solar panels at EnergyVille and deep geothermal energy in Mol. Making our vehicle fleet more sustainable fits within our efforts to reduce climate change. Switching to an electric vehicle means a significant improvement in air quality. 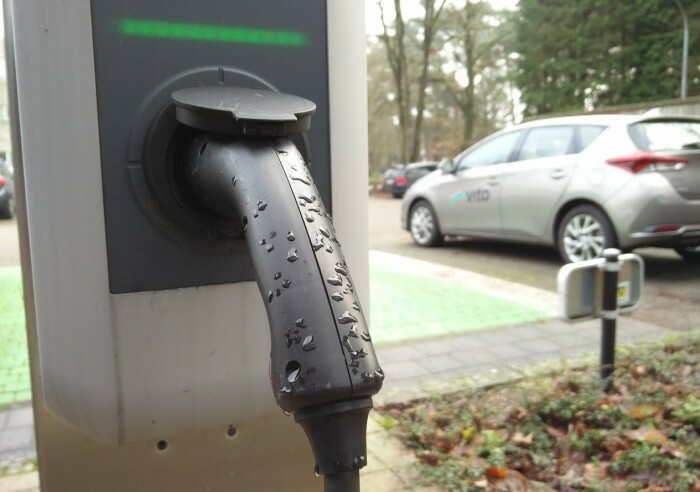 Electric cars produce no nitrous oxides on the road and very little particulate matter, two substances that still cause quite a lot of air quality issues in Flanders, especially on the major routes. “Our studies have shown that, on a WTW basis, an electric car running on ‘true’ green power1 emits up to 30 times less CO2 eq than a similar petrol car, and 3.5 times less pollutants (particulate matter, NOx, etc. )”, says Leen Govaerts, Unit Manager Smart Energy & Built Environment. The environmental benefits of electric cars increase considerably by generating the power from clean and renewable resources. This is why VITO is taking necessary measures to provide sustainable energy for charging electric cars. In EnergyVille this is already being done by the 1070 solar panels on the roof. At VITO in Mol we are awaiting the commissioning of the geothermal energy plant to generate enough sustainable energy. Additionally, the options for the installation of solar panels in Mol is being investigated. What does this mean for VITO? The electric and plug-in hybrid cars will also be used as living labs for the energy research conducted at EnergyVille, generating new knowledge on concepts such as smart charging. By disseminating this knowledge, we will contribute to the acceleration of the transition towards a sustainable and renewable energy system. Many companies and organisations are focusing on sustainability projects, but do not always know how to start or predict what impact this will have on the organisation. That is why we see it as our job to share our experiences, questions, successes and setbacks. In this way, we hope to tackle uncertainties and reservations in order to get Flemish organisations to step into their sustainability project with total confidence. 1 ‘True’ green power means power generated by solar panels, wind turbines, geothermal energy and hydropower. The production of the infrastructure is also included (refineries, solar panels, wind turbines, etc. ).